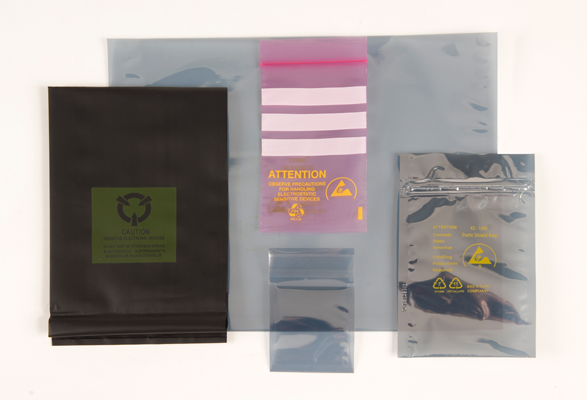 In addition to our expert consultancy services and range of unique desiccant technologies, we now supply a range of Anti-Static Bags. We made this decision because customers often ask us to solve issues of in-pack static-discharge, which can negatively affect electronic devices. Therefore, we now provide a wide range of hardwearing anti-static barrier foil pouches, as well of simple anti-static bags. Most noteworthy, these products guarantee the safe transit of goods, sensitive to Electro-Static Discharge (ESD). They prevent ESD damage by forming a Faraday Cage around your product. B-SURE ESD™ Foil Bags: Above all, these robust pouches control in-pack humidity and resist puncturing. We generally supply them to order, based on 3-4 ply structures. They typically comprise of conductive polyester or OPP, aluminium foil, nylon film, and also a heat seal layer of anti-static polyethylene. This will depend on your specific needs. They can also be printed with an ESD warning notice, if required. STATI-STOP™ Plastic Bags: These simple bags are standard stock items. They compose of a conductive metallised polyester layer laminated to anti-static polyethylene, where the polyester has an external anti-static lacquer coating. Even more, both B-Sure™ and STATI-STOP™ bags offer surface resistivity figures of less than 106 and less than 1011 ohms/squares. Also, they are both fully compliant with Mil-PRF-81705D Types 1 and 3. Flexible …we have a wide product range, so we can offer you an ESD bags that meets your exact needs. For help with your products’ ESD protection or any other problems that you have, please give us a call on +44 (0)1628 531900.